Golf grip is a key part of the golf game. Swinging the golf club and using the proper golf equipment is only part of the battle for success on the links. The golf grip is an important part and the first technical step to a good golf swing. There are some basic steps to utilize the proper grip. Whether off of the tee or on the green, holding the club with confidence is one step closer to success. You can get a feel for the club by holding the grip of the golf club against your left hand. 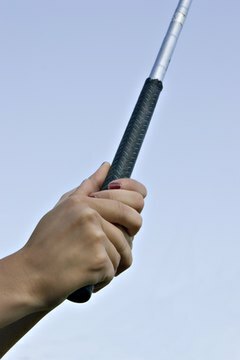 The golf club handle should extend on your palm from your pinkie to the crease of your middle finger. Your left hand (if you are right-handed) or right hand (if left-handed) with palm and top of your fingers should be curled around the club handle. By applying pressure with your last three fingers of your left hand, it will release pressure from your palm. Your right hand must have a good grip on the club as well. The area from the right pinkie to index finger will lay across the handle. The right-hand grip will allow your palm to the side and to a small degree on the club. The hold of both hands should come together to form a "V" from arm to hands. The "V" is formed by the index fingers and thumbs of both of your hands and points to the right side of your face. To hold a solid grip, you should wear a golf glove. If you're right-handed, wear the glove on the left hand. You can also wear gloves on both hands. The glove keeps the hand dry and allows you to form a seal between the glove and the grip.